Our Country Chronicles: Can I Share My Proud Moment?? Can I Share My Proud Moment?? My Amazing firstborn child. 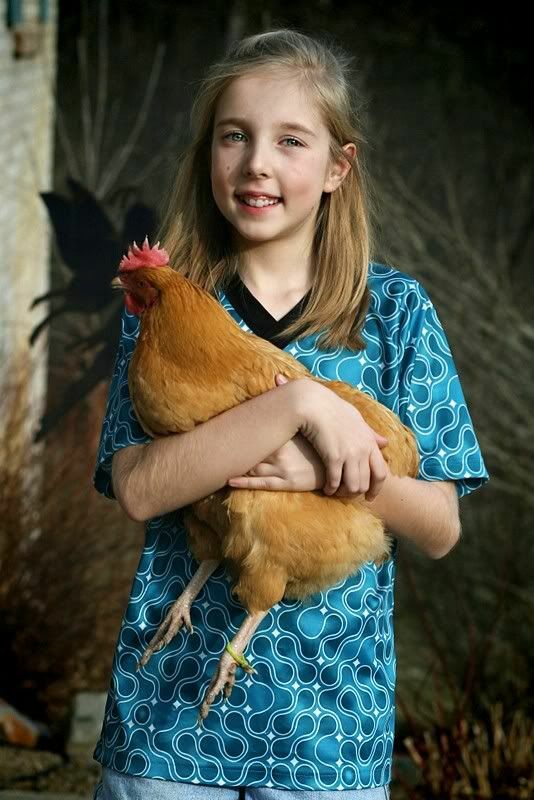 She LOVES her chickens. . .and her cats. . .
She loves any living animal. She is a very kind soul. Daddy was hoping at least one of his girls would show some interest in hunting. No such luck. They love animals way too much. She knows and loves her Lord and Savior Jesus Christ. She is an amazing daughter and the BEST big sister ever. This child is so smart!! This year, she was lucky enough to participate in a special program in her school called Math Olympiad. Only the top math kids can qualify to participate. They meet once a week and work to solve extremely difficult math problems. Once a month, they had a contest and the results were used to compete with other schools nationwide. The teacher who runs the Math Olympiad program stopped me last week at the science fair. She wanted to tell me how much she has enjoyed getting to know Tara and having her in the program. She then went on to tell me that she didn't want the rest of the kids to feel bad but she wanted me to know that Tara was the highest scorer in her group this year. I was so proud of her. Then she went on to tell me that she went back through 15 years of records, and in the 15 years that her school has been participating in the program, only 3 other children scored as high as her!!!! It was all I could do not to cry. I am soooooooooo proud of this amazing child. She has blessed my life in so many incredible ways. Thank you. I am VERY proud of her. She is just so incredibly smart. Her math is far beyond what I am able to comprehend. She's gifted with everything subject. Such a smart child. Such a blessing in my life. I love proud mama stories! Congratulation st all of you from Cliffside Chicken Ranch! That's Awesome. Tell her EVERY DAY how proud you are of her. Children need to hear that. Some people never tell their kids that and it's such a shame. 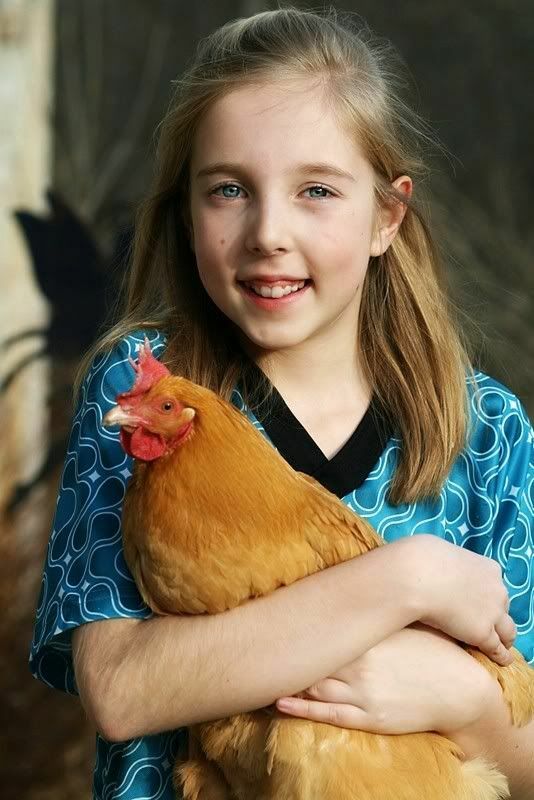 Tara you are so beautiful and I love your chickens. What a sweet, intelligent girl you are. 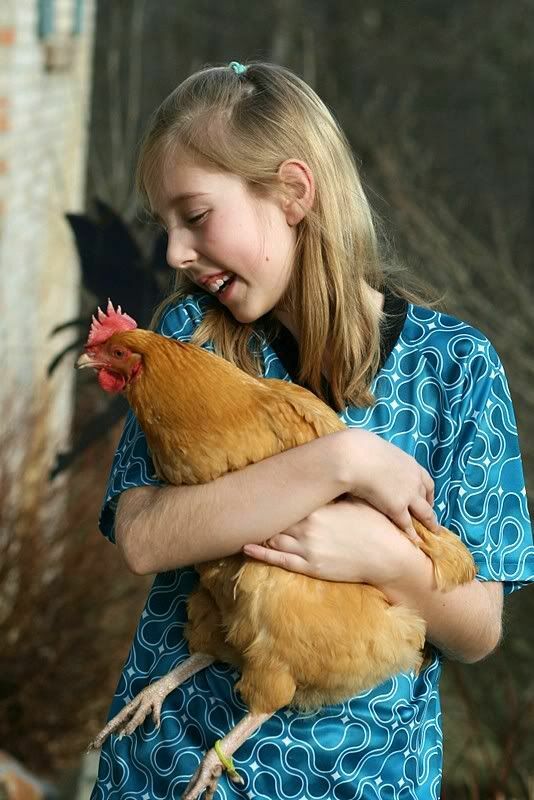 I love the pictures of you and your chickens! My 8 year old autistic grandson lives with me and we both love animals. He lives, breathes and sleeps animals and that is all he talks about. We have 2 cocker spaniels, 1 little pug, 4 indoor cats and a black and white hampster named Bear. Outside we have a garden pond full of fish. We will be adding a dozen chickens very soon. We have our coop built,ready and waiting. 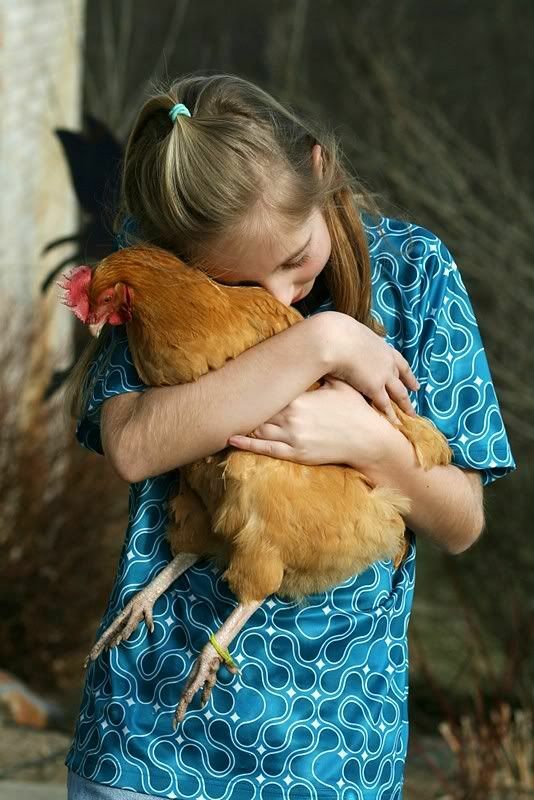 I hope that he will love our new pet chickens as much as you obviously love yours. Your mom is so proud of you, she is a very lucky lady to have a wonderful daughter like you!!! What a wonderful response. At school, Tara and Madeline part of the LINKS program. The children that participate in it are paired up with an autistic classmate and have a time of day that they spend with their LINKS partner. They help them with lunch and sit with them, then play on the playground with them. They might have a dedicated time each week to read to or with them. Tara and Madeline both love participating in the LINKS program. Tara loved your comment. She loves how much your grandson loves animals. What a blessing he must be in your life!! That is wonderful! I'm glad the teacher told you. It would have been a shame for Tara to miss out on knowing that info just because the other kids would have hurt feelings. That is silly. Anyway, great job and as a person who isn't good at math, I will keep her in mind if I get in a bind with math! It's bound to happen sooner or later. I am sorry the teacher did not share it with all of the kids so they would have a chance to congratulate Tara too. What have we come to that we cannot recognize excellence because others haven't achieved it. Sigh. Tara I am very impressed. Keep up the good work in school and doors will be open to you later. I love you sweetie and so does your Uncle Steve and cousin Caleb. P.S. He is very excited about your story you are writing. Thank you Auntie Becky and Caleb! Tara, isn't it strange that a stranger from thousands of miles away, in another country can be proud of your achievements? I'm so glad you are doing well in school and for loving and caring for Gods creatures. Your parents have done a great job in raising you and your sister. PS I loved watching you and the chickens sledging a little while ago. It looked good fun! When Tara read your wonderful comment, she was just amazed. Someone from Scotland was proud of her!! You should have seen the pride on her face. You are a great guy to leave such a special comment for her! Good job Tara! I'm a total stranger, but I'd like to encourage you to stick with it! The world needs smart caring women! Thank you for the wonderful comment. One thing about Tara is that she is also a very good artist. She LOVES your work!! Especially the Mermaids!!! Congratulations to Tara. What a beautiful and smart girl! Keep up the good work! I love your blog, its fabulous! Thank you so much. Tara has been so loving how everyone keeps telling her where they are from. She is just beaming with each comment. Thank you Leigh. Hawaii!!! What a beautiful place to live. I have heard that there are tons of wild chickens in Hawaii. I read your comment to Tara this morning while she was getting ready for school, and she beamed. Congratulations, Tara!!! No wonder your Mom is so proud of you! You certainly should be proud to have such a wonderful daughter! She is sweet, smart, kind and lovely....a true blessing. Thanks for sharing and letting your readers have a little peek into your special family. Thank you very much Debby. I just love sharing our little adventures. Tara and Madeline really are amazing blessings in my life. I'm so glad to have been blessed by them. I'm here first time and I really like this! You make good photoes and You have very beautiful daughter. You can be really proud of her. I wish her success at school and still better and better growth in faith! Greetings for You all from Poland. Tara says thank you and she was very excited to see you come all the way from Poland to say such nice things. I hope you bookmark our blog and come back to visit often!! My Wonderful Etsy Shop! It's all things Mason Jars. Never water your garden again. Watch the Back To Eden movie FREE!! I'm a follower of Jesus Christ, married mom of 2 precious little girls, and keeper of 2 cats, and 5 delightful hens. The Dust Bath. . .
✿Follow by Email and get email updates directly into your inbox! Silly Swimming Chickens. . .I mean ducks. . . I mean chickens!! Do You Know How Fast Chickens Grow? Banner at the top created by little ole' me. Powered by Blogger.